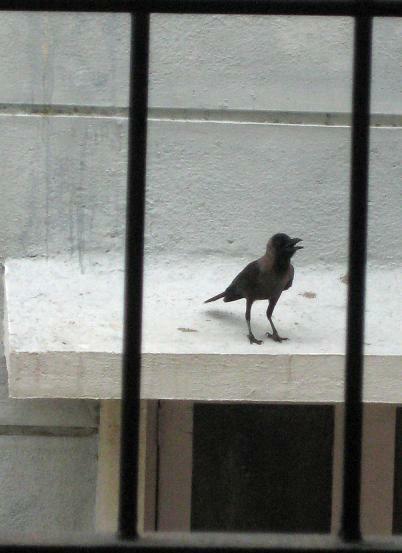 Standing on the balcony, as I was sipping on my early good morning coffee around 1pm last Sunday…I saw this crow perched on the window slab of the opposite building, calling out “caw caw” loudly. 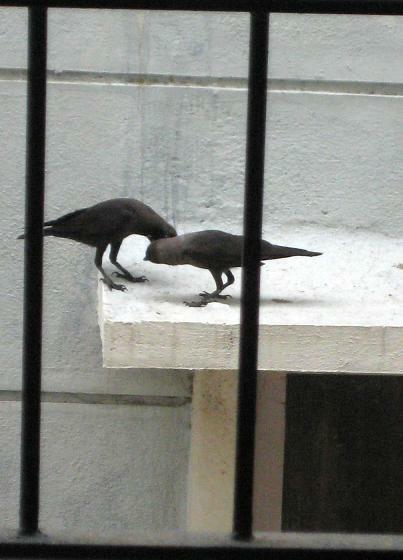 I didn’t realize it to be the “love call”…and in no time, did another crow (presumably male, by its behavior towards me) come to join its partner (presumably female, cos the other one I reasoned out to be a male 😛 ). The male was looking at me as if I would run away with his muse…huh…while the female (I was as much tired of its caw-caw, as it must have been “caw-caw-ing”) was whispering something to it. 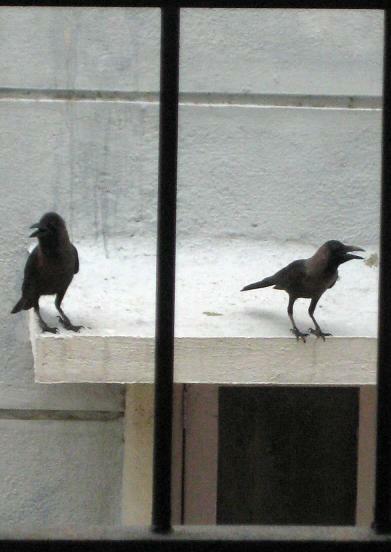 NOTE: No Crows nor their sentiments were hurt in the process. 1) Kya bolu – what can I say? Talks to all on the way with a loud voice! Uncle Mathew did have a great fall, if not for all! He was unaware of the things that were to befall! He got to look directly into her eyes, as he went down on his knees! “Yes I do” she said and hugged him tight, as he arose! Aunt Stella and Uncle Mathew they became, as age showed up on their face! 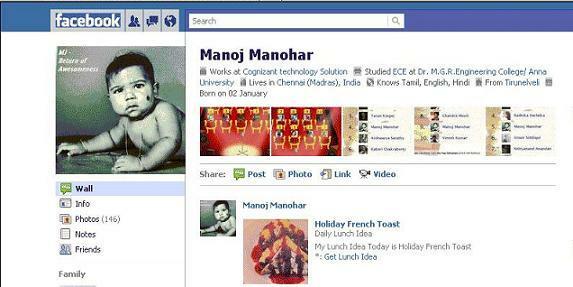 While Uncle Mathew sits retired at home, having no choice! I always end up trying to convince them with “Err…nooooo….nooooo…I don’t flirt…I…noooooo…nooo…flirt??…me? ?…I don’t…what?! !”…but to my bad luck, they end up not believing me. Hmmmph!! Did you just say “I don’t believe you”? WTF! This post is a result of these one-too-many enquiries….I decided to pick up a few lines and styles to flirt around…Ladies, in case you get to meet me…beware!!! I was standing at the bus stand…waiting for the ever punctual 9:45pm AC bus to arrive which would take me to the Chennai Central (Railway station) on my way to Bangalore…Standing beside me was a girl who by her looks and luggage, seemed like an IT geek on her way to hometown, waiting for the same AC bus as I was. I looked at her with naked eyes (yes, I wasn’t wearing my spectacles…what else huh? )….she looked at me…our eyes met…. 9. “Damn girl, u look so fine…. Life’s been tough…some random rants on a boring sunday late evening! 1. MJ was buried without his brains…as a tribute, the journos decided not to use their brains too and were seen smiling/laughing/very-excited at his funeral! hmmph! 3. The budget was cranky…nothing for the mortals like me…a saving of one grand could very well go if the erased FBT has to be borne by us, the employees! Sigh! 5. Things haven’t changed much regarding my train travels…I happened to travel to-n-fro with a bunch of retired strangers. The only problem with travelling in the same compartment as them is that they switch-on the lights and switch-off the fan minimum 2 hours in advance to reaching the destination. 9. Instead of being happy and satisfied at winning the T20 World Cup this year, Pakistan still has to point fingers at India. Shahid Afridi has said that India didn’t seem like they wanted to play Pakistan. He was right, cos we just wanted to win. (We won the warm up tie…and didnt get to face them again)!! Hmmph! 11. Talking about political power misuse…the latest one is Mayawati who is setting up “Maya Nagari” spending thousands of crores of tax-payers money in the name of caste-politics. She happened to inaugrate 25 statues (of Late Kanshiram and herself) in 2 hours flat last week. 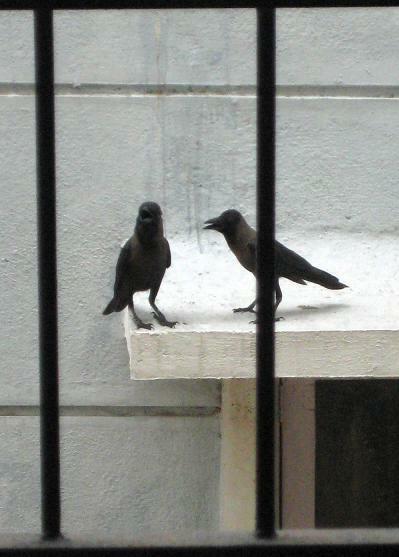 I wish we were crows and pigeons, atleast we could take give them their dues! Hmmph! 14. What has the world come to? Forget humans, even cartoons are not being spared. Intially there was hue and cry over Tintin’s homosexuality…and now it’s about Archie choosing Veronica over Betty! Atleast Archie chose a woman! The world isn’t happy over anything! Sigh! The word superhero caught my mind….resulting in nonsensical poetry!! 😀 Pardon me!! I wanna be a super hero…. Well known, popular and never misunderstood! Fly over skyscapers whenever I can..
By none other than my very own Mary Jane! Swing around that sword like a fan…. And be the master of the universe! I wanna be a Superman…. Work aside a reporter like Ms. Lois Lane….